For those who are long time fans of the Guilty Gear series you will be happy to know that the very first game released for the PS1 during the late 90’s will appear on the Nintendo Switch in the near future. Guilty Gear: The Missing Link was one of the best 2D fighting games of the 90’s and is still regarded to this day as a legendary title for the PS1. Since its initial release back in 1998 many people have wanted Arc Systems Works to port Guilty Gear: The Missing Link to current generation consoles. Even though, the original Guilty Gear game has appeared on the PlayStation Network in the past. The idea of seeing Guilty Gear: The Missing Link on the Nintendo Switch is exciting news since no one thought this was ever going to happen. If anything Guilty Gear May end up being one of the best 2D fighting to be released on the Nintendo Switch next to the Street Fighter 30th Anniversary Collection. As of right now there is no exact release date regarding the release of Guilty Gear for the Nintendo Switch. But as time progresses more details about the release date for Guilty Gear on the Nintendo Switch will eventually be revealed. Mario Kart 64 vs Gran Turismo which racing game was better? During the mid to late 90’s the world got to witness the release of two of the most popular racing video games ever. When Mario Kart 64 was released for the Nintendo 64 in late 1996 and early 1997 it was one of the biggest titles of the racing genre. Since it’s release Mario Kart 64 has managed to sell 9.8 million units worldwide which is impressive. After all, some can make the argument that the graphics of Mario Kart 64 was superior in comparison to the original Gran Turismo title that Polyphony Digital released back in 1998. However, the original Gran Turismo game was way more realistic than Mario Kart 64 and appealed more to adult gamers as opposed to kids. Not did players have the option to compete in Arcade and Simulation Mode But they also had the ability to earn driver licenses while makin money which Mario Kart 64 did not have. Also, in terms of sales the original Gran Turismo game reach over 10 million units worldwide in terms of sales and was one of the top games for the PS1. It’s very hard to choose between Mario Kart 64 and the original Gran Turismo game but both were classics that are remembered to this day by retro gamers who lived through the mid to late 90’s. Crash Bandicoot vs Banjo Koozie which game better? When it comes down to platform games of the 90’s two of the most well known titles that the world saw for the 90’s included Crash Bandicoot for the PS1 and Banjo Kazooie for the Nintendo 64. While both Crash Bandicoot and Banjo Kazooie were very popular its quite debatable among retro gamers which game was better overall. While some people would argue that Banjo Kazooie had better graphics since it was featured on the Nintendo 64 other would argue that Crash Bandicoot was a slightly more edgier character than Banjo was. Also, Crash Bandicoot did better than many people expected as far as sales were concerned. Since its release Banjo Kazooie had managed to sell over 6 million units worldwide on the PlayStation and has been known to be one of the best selling titles for that game console in the 90’s. Banjo Kazooie was also a huge success for the Nintendo 64 in terms of sales as it managed to sell close to 2 million units in America which was impressive. In terms of graphics there is no doubt that Banjo Kazooie had the edge over Crash Bandicoot. But it seems like Crash Bandicoot is slightly more relevant these days more than the Banjo Kazooie series which really makes it hard to choose. Should Xenogears receive an HD Remake? Sometimes its almost hard to believe that it has been about 20 years since Xenogears was first released on the PS1 back in February 1998. Ever since its release Xenogears was regarded as one of the best RPG titles of the late 90’s and has always been considered a game that deserved some type of remake from Square. Since the 20th anniversary of Xenogears is coming up next month there are most likely many retro gamers who have played this game who believe that Square should do something special involving Xenogears such as an HD Remake for the PS4 or even the PlayStation Vita. Even though, there is a lot of focus on the latest game in the series known as Xenoblade Chronicles 2 for the Nintendo Switch but Xenogears can still stand out on the PS4 as one of the top RPG titles of 2018 if it does receive an HD Remake. However, an HD Remake of Xenogears would have to compete with various upcoming RPG titles of 2018 such as Kingdom Hearts 3, Monster Hunter World and others. Could Metal Gear Solid have worked on the N64 during the 90’s? Back in the late 90’s the Metal Gear Solid game that was released for the PS1 was arguably one of the hottest action titles on the game console. In terms of sales Metal Gear Solid Tactical Espionage Action had managed to sell over 6 million units worldwide on the PS1 and was arguably one of the best games of 1998. Despite, the amount of success that Metal Gear Solid Tactical Espionage Action had on the PS1 there are some who question whether or not the game would have had the same amount of success on the Nintendo 64. Over the years there has been rumors about the fact that Metal Gear Solid Tactical Espionage Action was at one point scheduled to be released for the Nintendo 64. Whether those rumors are true are not is debatable but the reason why Konami never decided to port Metal Gear Solid Tactical Espionage Action for the N64 is something that many fans of the series have often thought about. Although, the PS1 was arguably a more popular console the Nintendo 64 had better 3D graphics. But, the N64 did have its share of popular games such as 007 GoldenEye and Perfect Dark which were both successful and sold million on that console during the late 90’s and the early 00’s. If Metal Gear Solid Tactical Espionage was released for the N64 it could have at least sold over one million units worldwide. However, Metal Gear Solid Tactical Espionage may not have sold nearly as much on the N64 as it did on the PS1. 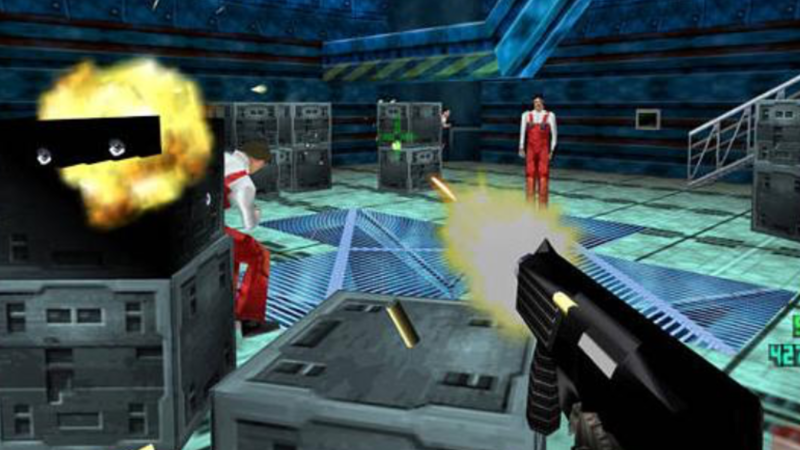 Could Perfect Dark have worked on the PS1? Perfect Dark was without a doubt one of the best first person shooter stealth games that we have ever seen on the N64. Everything about Perfect Dark such as the plot, gameplay and graphics made the game a classic. If the game was released for the PS1 instead of the N64 Perfect Dark may not have had the type of success that it had. By the late 90’s early 00’s many people were turning to games like Metal Gear Solid and Tomb Raider for the PS1. If Perfect Dark was featured on the PS1 it could have been easily overshadowed by many big titles that were on the console. Perfect Dark being an N64 exclusive back in the early 00’s is probably the the reason why the game managed to sell over 2 million units worldwide following its release in mid 2000. It also seemed like first person shooter titles were more popular on N64 while the PS1 seemed to have more third person titles that were memorable. While Perfect Dark could have worked out on the PS1 it was much better if on the N64 in the long run.